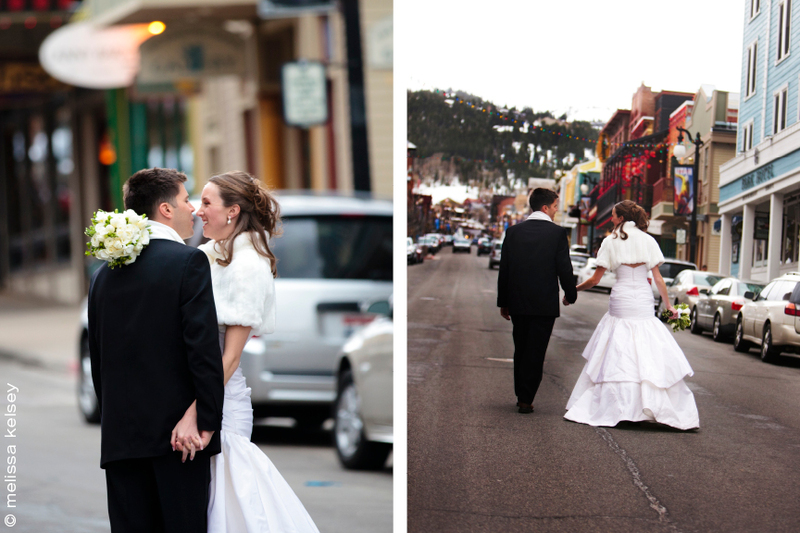 After Shane & Kathryn's wedding ceremony at St. Mary's Catholic Church, we headed up to Park City's historic Main Street. The color, texture, and personality of Main Street, make it a great place for portraits. Kathryn and I originally planned photos on a ski lift, but the weather derailed those plans. No problem, though. Kathryn was a go-with-the-flow bride and stopped for a little refreshment with her new husband and bridal party, at a local brew pub instead. Then, it was off to the reception at Park City Ski Resort, where there was glowing candle light, an assortment of cream colored flowers and natural wood accents (created by Kathryn, herself). Instead of a traditional wedding cake, Kathryn and Shane had a croquembouche, a traditional French wedding cake, made up of a tower of cream-filled, caramel-dipped cream puffs. Kathryn's parents also had one at their wedding. Turns out, it's good luck to kiss over the croquembouche at your wedding, as long as you don't knock it over. The croquembouche stayed well intact that night. The remainder of the night was filled with hilarious toasts and lively dancing. I always feel honored to be privy to such a personal event as a wedding. The toasts make me laugh and I learn a little more about the couples I am photographing, through the words of a couples' friends and families. I feel a little like I'm a part of their lives for one night, connected to them, even if I won't see them again. It sure is nice. Congratulations to Kathryn and Shane, a really lovely couple.